Hercules and Hemings: Presidents' Slave Chefs Hercules, a slave of George Washington, and James Hemings, owned by Thomas Jefferson, began a long connection of presidents and their African-American cooks. And President Lyndon Johnson's black cook may have influenced his work on civil rights reform. Read recipes for "Snow Eggs" by James Hemings, Thomas Jefferson's chef, and shrimp curry by Zephyr Wright, a cook for President Lyndon Johnson. In the early 1800s, African Americans cornered the market in the catering business in Philadelphia. Historians Sharron Conrad and William Woys Weaver talk about how these catering families became the arbiters of taste for the wealthy white community. From an oral history recording, Zephyr Wright describes how she helped President Lyndon Johnson curb his voracious appetite. William Seale delves into the little-known history of liquor in the White House, from Madison to Bush. 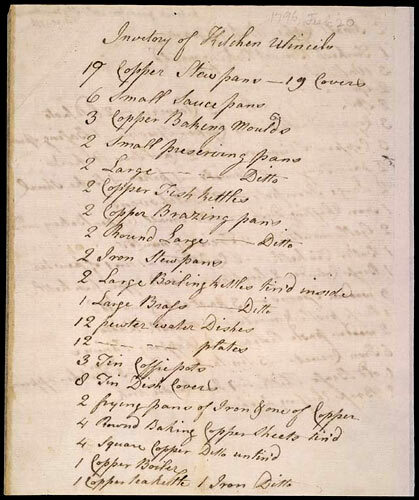 A list of kitchen equipment written out by James Hemings, Thomas Jefferson's chef, before Hemings left Monticello. Dolly Johnson, cook for President Benjamin Harrison in the early 1890s. Johnson, who had cooked for the Harrison family in Indiana, was summoned to the White House by President Harrison to replace Madame Petronard, a French chef. 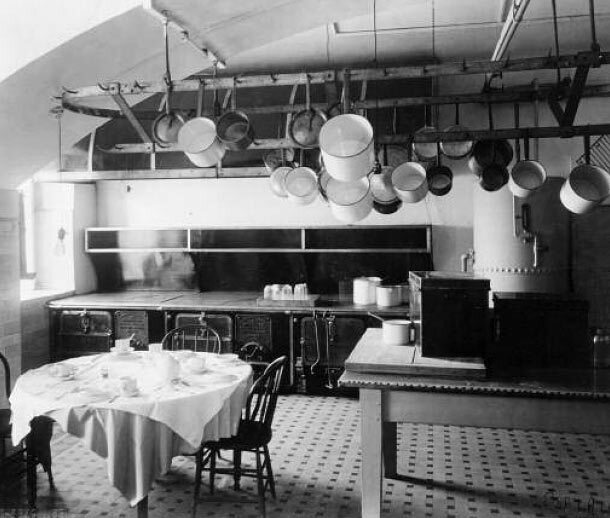 One observer noted: "The President likes the plain dishes of Dolly Johnson ... better than the complicated French menus of her predecessor ...."
The White House kitchen, seen in 1901, was used for main events and more formal entertaining. The round table at left is set for a staff meal. The presence of electricity, introduced to the White House in 1891, can be seen by the wiring placed along the ceiling. Vietta Garr worked as Harry Truman's cook in Independence, Mo. When Truman became president, he requested that Garr come to work in Washington, D.C., not as a cook but to instruct his staff on how to cook the "Missouri way." She was the granddaughter of Emily Fisher, an ex-slave who ran a hotel on Independence Square. Luci Johnson (left), one of the President Lyndon Johnson's daughters, speaks to Zephyr Wright during the White House cook's birthday party in 1965. See more photos, recipes and stories from the slave gardens of Monticello, W.E.B. DuBois' writings on African-American caterers in Philadelphia, black chefs in the White House, and President Eisenhower's passion for cooking. 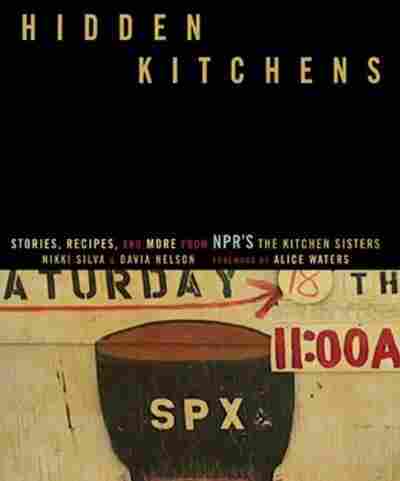 Some kitchen stories are complicated — full of mystery and missing pieces — the truth hidden by time. No photographs to capture them, little historical record to go on. 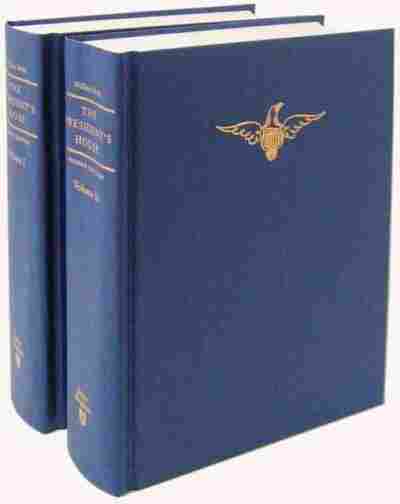 "Hercules and Hemings" is one of these stories. In this piece, Hidden Kitchens turns its focus to the president's kitchen and to some of the first cooks to feed the Founding Fathers — the enslaved chefs of George Washington and Thomas Jefferson. "It was Hercules who really began this long connection of presidents and African- American cooks," says Sharron Conrad, historian of African-American cuisine. 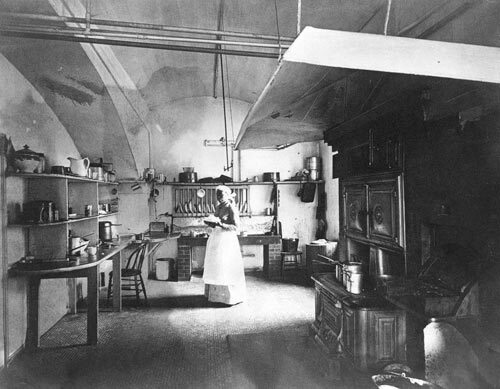 She began researching this connection for her article The President's Kitchen: African American Cooks in the White House. Hercules, one of George Washington's slaves, came to be the chef of Washington's kitchen at Mt. Vernon and later in the nation's early capital in Philadelphia. Hercules, Cesar — names of Rome and antiquity were often bestowed upon slaves along with the last names of their owners. There is a portrait believed to be of Hercules painted by Gilbert Stuart, the same artist who did the most famous portrait of George Washington. Hercules gazes out across history, "a large, cinnamon-colored man in immaculate chef whites with a kerchief tied around his neck and a toque," says Jessica Harris, culinary historian and author of The Welcome Table: African American Heritage Cooking. Harris led us to this story when we heard her give a talk entitled "Feeding the Founders." As we began to dig into the lives of Hercules and Hemings, the little-known stories of black cooks in the White House throughout history began to surface. 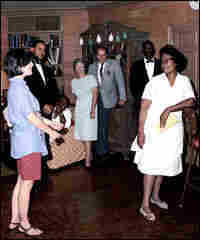 Dolly Johnson cooked for President and Mrs. Harrison. 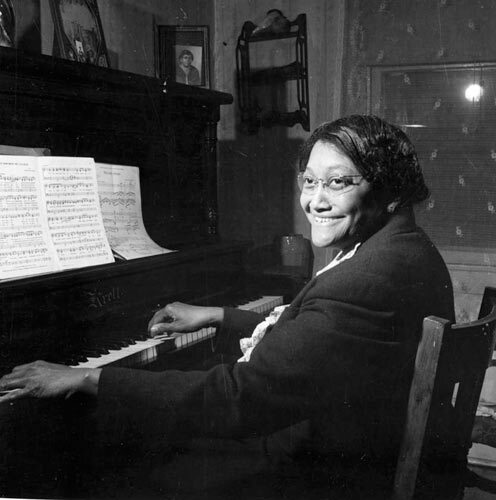 Johnson had been the Harrisons' cook in Indianapolis and was "called to the White House sometime around 1890 to replace French chef, Madame Petronard," Conrad says. 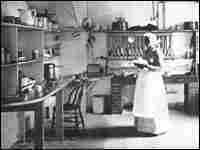 Mary Campbell cooked for Franklin and Eleanor Roosevelt. Harry and Margaret Truman brought Vietta Garr with them to the White House. Lyndon and Lady Bird Johnson came to the White house with Zephyr Wright. Mrs. Johnson hired her when Wright was a home economics student at the historically black Wiley College in Texas. 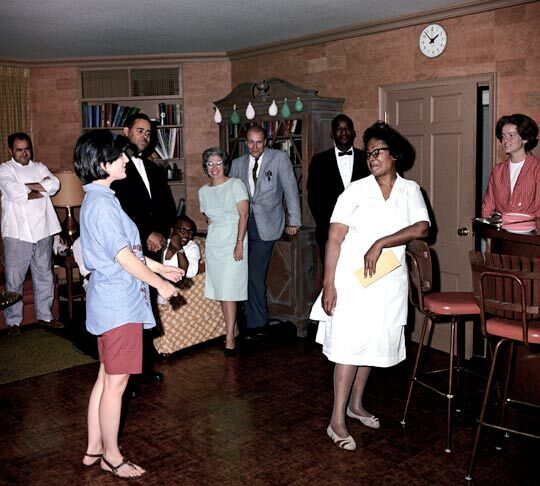 She cooked for the Johnsons for 27 years in Texas and Washington, D.C.
"The first night that I met President Johnson, he was late as usual. He was always late for meals .... Now there have been times that he'd get on the phone himself and call me and ask me how long would it take to get something ready for the whole Cabinet and sometimes he'd walk in with them and you didn't even know he's coming. And I've seen a time that I've fixed a meal in 10 minutes for 25 or 30 people." President Johnson's awareness of the difficulties Wright experienced traveling through the segregated South — the hardship and humiliation of not being served in restaurants on the road, the difficulty of finding accommodations — are believed to have influenced his work on civil rights reform and legislation. "You can't even consider the history of the White House without realizing that the common denominator of White House life is the dinner table," says historian William Seale, author of The President's House. "When George Washington took office, he wasn't the king, he wasn't the sovereign. He was a combination of head of state and prime minister. It never happened before; nobody ever had one of those. So it was very delicate with him how to proceed in terms of diplomatic tradition. So food became very important." Hercules, Washington's slave chef, may have been trained by Martha Washington. It was Martha who brought slaves into Washington's home when the two married. Martha was known for her table and for her "Great Cake" (40 eggs, four pounds of butter, four pounds of sugar, five pounds of flour, five pounds of fruit, a half-pint of wine and some fresh brandy). "A lot of it was touch and go in those kitchens," Seale says. "Just imagine putting a cake in a pot with a bigger pot around it with coals in it and knowing when to take it out. 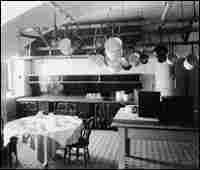 Of course, there were no thermometers; the old cooks had to know that. They had to have an eye for that." Martha Washington's grandson, George Washington Parke Custis, remembered Hercules as "highly accomplished and proficient in the culinary arts as could be found in the United States." Seale called him "the commander of the kitchen. He did everything, all the souffles, almond pudding, trifles, fricassee chicken, kidney, etc." Hercules had eight assistants — stewards, butlers, undercooks, waiters. He cooked in a huge fireplace — hearth cooking. The fireplace was full of a series of iron pots, hooks and cranes to lift and move the kettles. The job was long and hard, especially in the hot summer. The cooks and kitchen crew had to build the fire, burn it down, gauge the temperature by hand and gather fuel to keep the long-burning fires fed. Hercules is described as being immaculate and impeccable. Harris, the historian, says he was noted for being a "dandy." He walked through the streets of Philadelphia in a velvet waistcoat and a gold-handled cane. He probably got the money to buy his clothes by selling leftovers and kitchen waste, a privilege sometimes given those in special positions. Hercules was well known around town and people would follow him as he walked through the market. "Philadelphia had one of the largest open-air markets in the world," says William Woys Weaver, a food historian and author. "The boats came in from Cuba three days a week, so there were bananas and pineapples, and if you had the money, you could get practically anything you wanted. George Washington loved an apple that came in the fall; it's known as Washington's favorite. Big yellow apple, it's now unfortunately extinct. He would send his people out in the market and buy every apple out there. And the other Philadelphians in their diaries and letters grumbled about this president who's hoarding these wonderful dessert apples." When Washington was getting ready to leave Philadelphia to return to Mt. Vernon, Hercules escaped. Washington sent out search parties and offered rewards. Hercules was never found. Harris says, "A French visitor to Mt. Vernon asked one of Hercules' daughters how she felt about her father running away. She replied, 'I miss my father, but I know that he is free and so I am happy for him.'" Many people have heard of Sally Hemings and her suspected relationship with Thomas Jefferson, which, Harris notes, "is increasingly becoming not alleged but a matter of DNA fact." But most of us do not know of her brother, James Hemings, who was also a slave to Jefferson. In 1784, Jefferson was appointed minister to France and left Monticello to negotiate treaties of commerce for the new republic. He took with him his body servant, 19-year-old James Hemings, to master the French style of cooking. Hemings apprenticed with well-known French caterers and a pastry chefs. "James went from the hearth cooking that was the good solid country cooking of Monticello into this complex multi-service, class-oriented cooking in France," Harris says. He learned how to cook on a potager, a stew-holed stove, and he learned the art of saucing things. It was the time of the French Revolution and there was great upheaval in Paris. "As the society was democratizing itself, so was the food," Harris says. "We see in Paris the development of restaurants, which comes from the French word restaure, to restore. It was food coming out of the chateau, coming out of the royal kitchens, becoming more democratic. At the same time, the Royal Family is falling. Jefferson's enslaved chef, James Hemings, was there to witness and be a part of these changes." 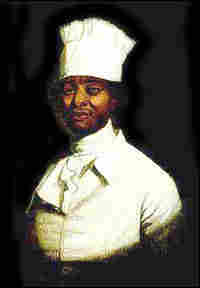 Hemings assumed the role of chef de cuisine in Jefferson's kitchen on the Champs-Elysees, earning $48 a year. Under French law, Hemings could have claimed his freedom at any point. There was no slavery in France at that time. But he didn't, and the reason remains a mystery. 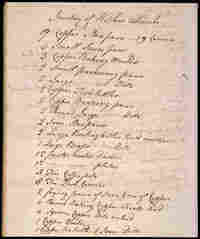 Hemings returned with Jefferson to the United States along with copper pots, wine, olive oils, recipes for ice cream and seeds to be planted in the Monticello garden. A potager was installed in the kitchen. In 1793, Hemings petitioned Jefferson for his freedom. Jefferson consented upon one condition, "if the said James shall go with me to Monticello and shall continue until he shall have taught such persons as I shall place under him for the purpose to be a good cook ... he shall thereupon be made free." Three years later, having fulfilled the terms of the "manumission" agreement by teaching his brother, Peter Hemings, the cooking techniques he had learned in France and at home, James Hemings became a free man. "He departed Monticello leaving behind him only a well-written inventory of the kitchen and some recipes, and other writing in his own had," Conrad says. Many of the enslaved cooks and others in plantation kitchens throughout the South were never taught to read and absorbed recipes for French and European cuisine by having them read to them. What happened to James Hemings after he left Monticello is a mystery. "He was asked to return to cook when Jefferson was in the White House, but he refused," Harris says. "Beyond that, we don't know." "James Hemings received his freedom in the same year that Hercules escaped," Conrad says. "Hemings and Hercules are both in Philadelphia at the same time. In a city with only 210 slaves, surely Hercules and James Hemings were each aware of the other's existence. It would not surprise me in the least if James' freedom may have helped inspire Hercules to take on his own freedom." Produced by The Kitchen Sisters (Nikki Silva & Davia Nelson) with Laura Folger, Nathan Dalton, Eloise Melzer, and Moira Bartel. Mixed by Jim McKee.